In this 2-part interview (audio and video), I speak with Edward L. Kimball: son of the late LDS Prophet Spencer W. Kimball. 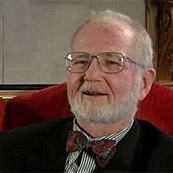 Edward Kimball is a retired law professor from Brigham Young University, and author of two biographies on Spencer W. Kimball: Spencer W. Kimball and Lengthen Your Stride, the Presidency of Spencer W. Kimball. Edward has also been an active supporter over the years of both Dialogue: A Journal of Mormon Thought and Sunstone magazine. I enjoyed it very much. As always thank you for all your hard work and dedication! Fantastic interview and what a great opportunity to talk with the son of a church president with questions that we would all like to ask. John you are a master of diplomatically asking the probing questions and showing great respect for those you are interviewing. While I am a congenital skeptic, I found Brother Kimball open, honest and refreshing. He is they type of church member that we need more of. However, I find it difficult to understand how he did not take the opportunity to sit down with his father and pose some frank questions about the mechanics of being a prophet. To use John’s analogy of the “bat phone” to God, if my father were prophet I would be pushing him on every detail about his “discussions” with God. I would ask him outright if he had ever seen God or Christ. I would want to know what he really thought about the origins and evolution of blacks being denied the priesthood and many of the other wacky parts of LDS history. He left the impression that most of his deep discussions took place with his mother. I just cannot imagine being the son of a church president and not pushing hard for some honest answers to some tough questions. I also would not accept placing anything on the “theological bookshelf of the unknown” to be addressed at a later time coming from the president. My summation from the interview was that Spencer Kimball was an ordinary man with an ordinary family who ended up in an extraordinary position in the LDS Church. Thank you John for pulling these interviews together. I couldn’t get enough of this interview! It was fascinating. I would love to hear more from family/relatives of LDS prophets. Wow. It’s wonderful to hear that perspective. Thank you for the interview. I absolutely love them all. This was a masterful podcast, John. Also, more in line with the agenda of ‘Stay(ing)LDS,’ while at the same time not avoiding to probe some of the more troubling issues that certain members may be burdened with. Great contrasts and harmonizations manifested here, and again, masterfully orchestrated and edited. Great job, John! You have a great way of talking about the tough subjects in an open honest way without being threatening. I wish that more of the people in the church could discuss things in this way. I don’t think it would cause me to regain any of my demolished testimony back but it sure helps me to feel better about people when I listen to you and Edward Kimball. Listening to someone like Brother Kimball vs. listening to people like most of the apologists is the difference between feeling understanding vs. feeling bitterness. FAIR and The MADB need to listen to more of your work. Thank you so much to both John and Edward Kimball for a most enlightening discussion. I did want to let everyone know, however, that the special edition of “Lengthen Your Stride, the Presidency of Spencer W. Kimball” printed by Benchmark Books is completely SOLD OUT. However, if someone is interested in this content, it is available on the CD that is included with the Deseret Book edition. Amazing podcast. Thanks so much for doing it (both of you!) I especially liked Edward’s approach to dealing with the difficult historical issues….and that if he was going to be wrong, he’d rather err on being inside the Church. Such a humble attitude. Beautiful interview. I have nothing much to say other than it was insightful. Edward’s middle road approach is refreshing. His commentaries were insightful and candid. Ditto to everything said above. For as cynically hardened and skeptical as I can get sometimes, this really got to that gooey Mormon center in me. My grandparents grew up in that era in Arizona — in fact, I think my grandmother even babysat Edward when he was a young tyke (back in the day when they used words like “young tyke”). It touched a real emotional chord in me to think about how different their world was just a few generations back — and once again I sort of ached for that innocent childlike faith — the time behind when my mind wouldn’t push those precious things away. Great job — again. What a gentle, wonderful man. What would the church look like if it were filled with people like him? Heck, I might even still be active. I really enjoyed this interview — fascinating insights. What a great interview. He sounds like a great guy. I never grew up with President Kimball but it was interesting learning a little more about him. I loved the beginning of Part 2 where you where talking about the concern that decisions are sometimes made through capital and that the right people have to die, etc. And he said “I see no inconsistency, I think all those things are true… It doesn’t, to me, run counter to the reality of revelation.” It seems like we often have a over-simplistic understanding of revelation. It’s like how Karen Armstrong says we talk about God in a way that is “facile”. Jacob encountered God by “wrestling” with him all not long. Revelation can be more of a battle than a conversation on the bat phone (great term by the way). Great interview! I just hope that when I’m 80, I am as sharp and articulate as Ed Kimball. Excellent work John!!!! That podcast shot up to my Mormon Stories top 10 list. People like you and Edward Kimball give me hope that I may reach that middle road someday. This was great! President Kimball died when I was about 4 years old, and at the time I didn’t really know what a prophet or a president of the church was (my parents were still pretty new to the church at that point, so I didn’t spend my childhood playing “conference bingo” like some of my friends did). But I can remember being sad that he died because he looked like a nice man, and I’ve always been interested in his life. So it was nice to hear about him from his son. That was a fantastic interview. I think one of my favorites, if not the favorite. His love for the Church while seeing things as they really are (and still hopeful and faithful) is where I’m trying to be. I felt like I was listening to a friend during the interview. John, you ask all the right questions and you ask them the right way. Thanks for all that you do!!! Enjoyed it thoroughly. I guess we don’t realize that having a GA in the family might not be as special as we all dream it would be. Sometimes a dad is just a dad…..
How wonderful to have Ed Kimball’s thoughts, perspectives and reminiscences memorialized in this way. I doubt the Church would do it, so thank goodness for John and Mormon Stories. Absolutely the best interview John. Ed Kimball is very comfortable being interviewed and you ask great questions. I listened to much of the interview twice because of the gems I found. Fascinating, touching interview. Ed Kimball’s kind demeanor, gentle tone, and insightful comments give me the impression that he has lived a rich, interesting, harmonious life among the people and culture he loves. What a wonderful life that would be. On the other hand, he declares that he believes because of his desire to believe and in spite of conflicting evidence. Isn’t that the definition of intellectual dishonesty? I don’t know how to get comfortable with that. This was a great interview. Ed Kimball is a fascinating man who was fortunate enough to live a remarkable life. The bow tie says it all. I can’t help but wonder what President Kimball would have to say about his son’s “middle road” (this is the most true church)/universalist approach. It was interesting to learn about how one of President Kimball’s sons left the church and he was unable to persuade him to come back. headquarters at his office. He looked directly at me and said, “Have you read my book?” I didn’t answer that question directly, instead I offered my young son and announced he was named Spencer. He laughed, and admired the baby. I like Ed Kimball. Better yet, I like his middle road approach. He sounds like a cultural Mormon. That’s me also. Thanks for the interview. It brought back so many memories. Not only do I look like Ed Kimball, but I think like him. This is an awesome interview and shows the diversity of opinion in the church (often unexpressed). No matter what your circumstance, we all have to deal with the big questions and come to our own conclusions. Bless you John for being so honest in your approach. It is a soothing balm. One thing not touched on in this interview was Spencer W Kimball’s attitude towards homosexuals. in the late 70’s he concluded a Conference address, which I was listening to on radio, by saying that some homosexuals were born that way (exact word were something like, “some unfortunate individuals may be born that way”). I was thoroughly impressed, but when I looked at the conference edition of the Ensign, it had been edited out. The original comment was at least an example of how SWK was open to ideas and loved all people. Fabulous! Thanks John and thanks Brother Kimball. I liked how he described himself as a ‘doubting believer’. I can relate to that. I also thought that he would have stories of mind blowing spiritual events. It was refreshing and honest. It was also refreshing to here that President Kimball didn’t know every answer to every question, that he was more akin to the rank and file than we might have expected. I’ve tried telling people at church about this but they don’t want to know. Blows the mind. Pingback: Mormons for Marriage » They Said What? When? What a gift! This interview was tremendously enriching and faith-promoting. There were so many aspects of Brother Kimball’s faith and testimony that touched me. His willingness to share so much of his rarely-expressed personal beliefs is a testament to your skill and earnestness as an interviewer. Thank you for your work in broadening the spectrum of Mormonism. I love the intro song. Can I get the name of the artist? John: I just saw your recent “Best of…” lists. I always considered this one of your best Mormon Stories. If every Mormon acted like Edward, I could have probable stuck with the New Order Mormon thing. Sadly, Edward passed in late 2016. Incredible comments in hit obit. Nice that you were able to grab this interview. I occasionally listen to a Mormon Story Podcast. I sometimes enjoy them but often don’t. I skip around looking for ones that are not run of the mill faith crisis stories. This is the first time I have commented. Most of the stories I hear of people having crisis of faith don’t relate to me because they are so different from my Mormon journey. However Ed Kimball ‘s interview was the first person I related to; at least in part. First of all, my faith is based on a series of personal experiences. I have had somewhere near a dozen or possibly more spiritual experiences through my lifetime that can only be described as God intervening to my benefit. These experiences have resulted in a belief in Jesus Christ. So when I hear stories about Jeffrey Holland equivocating or a Mission President approving ridiculous youth baptisms in Honduras, they do not create a crisis in faith for me. My faith is based upon Jesus Christ so when men in positions of religious authority make mistakes or even deceive, it doesn’t result in my faith to imploding as I realize they are the mistakes of fallible men. Jesus Christ doesn’t falter. I have a masters degree from the U of U and did relatively well academically. I am not especially intellectual but am well read enough in Church History to know and understand all of the problems that have caused others to abandon the church. Ed Kimball’s handling of theses questions in his interview was refreshing. I wish you could have more of these kind of people. It’s easy to understand how people’s faith implodes when confronted with troubling historicity but it’s much more interesting to understand why other people (who are obviously intelligent like Ed Kimball) confronted with the same troubling historical events can maintain their faith. I’m not talking about people who privately don’t believe but stay active due family or social concerns. I’m talking about people like Ed Kimball who can articulate a rational basis for continued belief in light of difficult historical events.